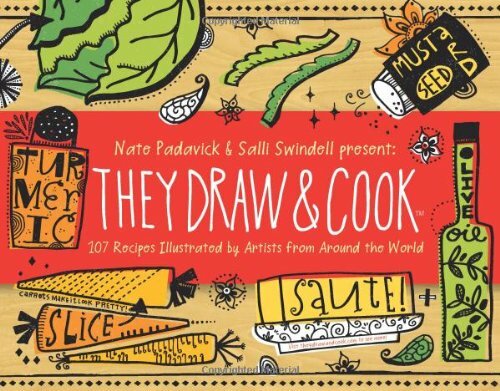 In February 2010, Nate Padavick and Salli Swindell started a blog called They Draw & Cook for people to share their illustrated cooking recipes. They have since collected over hundreds of them and this book features 107. Wow! That will take a a while to cook all of them. Each artist featured has their own unique style and it's delightful to look through all of them. The illustrations are beautiful, fun and sometimes humourous. You can't be sure who's cooking. It could be a 16-arm chef for one recipe, and the next might be a rabbit and raccoon teaming up to dish out something. Or even the ingredients themselves, they might look too cute to be cooked. Some of the recipe titles are pretty fun too. Chicken in Love, Starving Artist Goo-lash, Top Model Salad. They are lots of illustrative stuff to check out. Many are created in traditional medium for the extra textural appearance. If you're in the mood for some cooking, get this book and give it a go. Check out more artworks and recipes at They Draw & Cook website or their Twitter page, or even submit your own.